The first Drascombes were built in the mid 1960s and an Association of owners was formed in the early 1970s which flourished for a few years and then died when its founders moved on to other things. While the Association lay dormant, Drascombes continued to multiply and, from the late 1970s on, groups of owners in various parts on the United Kingdom and abroad (notably the Netherlands and the United States) got together and held rallies. The success of these rallies led to a movement to re-form the Association and this happened in early 1987. It was an immediate success, with over 100 owners joining on formation, a number which has steadily increased to around 1,200 members today. 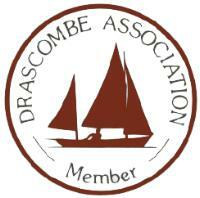 A lively and informative magazine, Drascombe Association News, is published in February, May, August and November each year and sent to members. The DAN along with the Website and online Forum, contain articles of technical and general interest contributed by members as well as news and information of events organised by the Association. (A Sample edited pdf version of DAN is now available for non members; click the cover above to download.) and the online Forum has many areas open to Guests. Weekend rallies and longer cruises-in-company are a feature of the Association with many such events being held at coastal and inland locations in the United Kingdom and Ireland each season. Close contact is maintained with groups in France and the Netherlands enabling members also to take part in events on the mainland of Europe. The Association sells (to members only) books and other items associated with Drascombes and seeks out suppliers producing clothing, jewellery, etc., of interest to members. Details of what is available are published in each issue of the magazine. The management of the Association is in the hands of a Committee elected each year at the Annual General Meeting. The Committee is composed of a Chairman, Secretary, Treasurer, Vice-Chairman, other post holders and members representing the geographical areas of the UK and Ireland.